Play ended on Day 3 of the WSOP Main Event with Matthew Hopkins eliminated on the bubble & the final 1,182 ITM. Day 3 of the 2018 World Series of Poker (WSOP) Main Event has come to a conclusion with the remaining players all heading home assured of an in-the-money finish and a guaranteed $15,000 payday. Following three Day 1 flights, and two Day 2 flights, just 2,786 players remained in the Main Event, and for the first time they would all combine to play together here on Day 3. Everyone's eyes were on reaching the final 1,182 to be in the money, but that would be easier said than done as over half of the players needed to be eliminated throughout the day for that to occur. With players located across three separate rooms, action would be intense to start the day as a plethora of eliminations began the table-breaking process. Jason Mercier, Parker Talbot, Greg Merson, Matt Waxman, Matt Berkey, JC Tran, Loren Klein, Phil Hellmuth, Eli Elezra, Erick Lindgren, Tom Marchese, and Steffen Sontheimer were just a handful of the big names falling short of the money. For Hellmuth (pictured below), his day would be spent at the feature table where he was catching plenty of heat from players and fans. In the end, Hellmuth would see his tournament come to an end at the hands of Jans Arends. 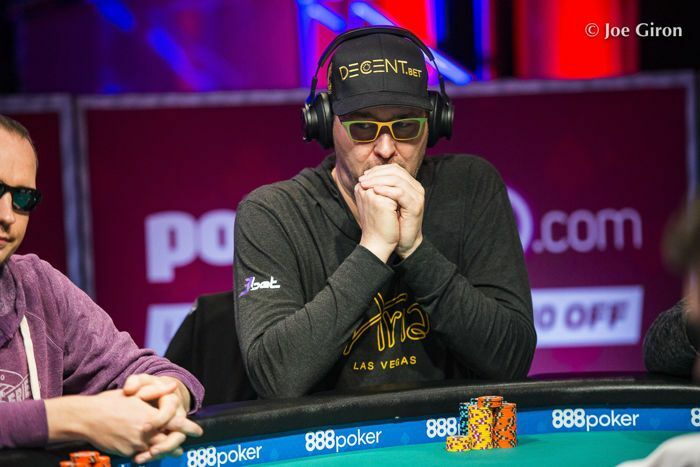 Hellmuth held against Arends' , and although he held the heavy advantage, when the dealer spread the board, Hellmuth was eliminated from the Main Event. Phil Hellmuth caught heat on the feature table of the 2018 WSOP. As the day progressed, several players began making their run up the chip leaderboard. Frank Flowers was having the time of his life in the Brasilia Room laughing with players and having a great time all the while he continued to accumulate chips. Eventually, Flowers would be moved to the feature table, and then into another section of the Amazon Room where a monster hand occurred that saw him crack aces with tens, while also doubling a short stack up who made quads. However, the true story of the day would be the bubble bursting in the Main Event. 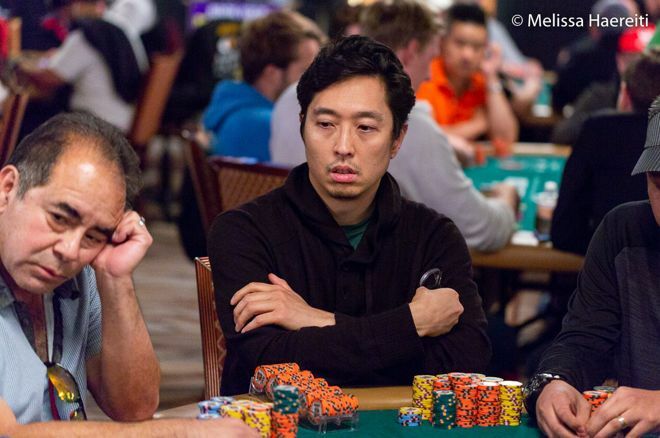 With an hour remaining in the final level, the players were sent on an impromptu break as the WSOP staff relocated every player into the Amazon Room for the first time during the tournament. From there, a further 22 eliminations needed to occur until the bubble burst, and once play resumed, the eliminations occurred at a slower rate than before. Hand-for-hand play was finally reached with just over one minute remaining in the level, and in the day. On the first hand of the hand-for-hand process, there were three all-ins for the players for the crowd to sweat. Gerard Cassis found a double holding against , before Paul Volpe and Ryan Messick chopped with aces. The third hand, however, would see Sam Taylor's trip aces cut down by Chi Chan's full house, and the Main Event was on the stone bubble. Players were then sent on a 20-minute break for the color-up of the blue 500-denomination chips. On the first hand after the break, two all-ins would occur. Ross Mallor would found himself all in holding against Ben Cade's , and when he flopped a king and turned an ace, Mallor doubled. Unfortunately for Matthew Hopkins (pictured below), he wouldn't be so lucky when over on the feature table he was all in against Bryce McVay's . 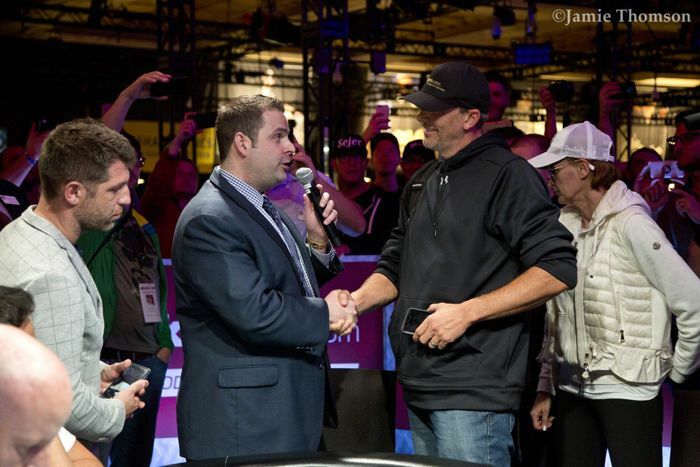 The final board ran out and Hopkins would be crowned the Main Event bubble boy; but in the process receive an entry into the 2019 WSOP Main Event. Matthew Hopkins got an entry into next year's Main Event for busting on the bubble. With Hopkins on the rail, the remaining 1,182 players were in the money and guaranteed a $15,000 payday as play would officially be concluded for Day 3. Leading the remaining players into Day 4 is In Sun Geoum who, courtesy of an aces-versus-kings confrontation, rocketed up the leaderboard and retained his position to end with 1,696,000 in chips. Flowers is snapping at his heels with 1,624,000, while Alexander Wong (1,431,000), Samuel Bernabeu (1,418,000) and Eric Sfez (1,390,000) round out the top five. Michael Lavenburg and Julius Malzanini are right behind Sfez, with 1,356,000 and 1,292,000, respectively. Play is set to resume for Day 4 on Sunday, July 8, at 11 a.m. (PDT) with the PokerNews Live Reporting Team providing all the continuous live updates. So stay tuned to PokerNews.com for continued coverage of the Main Event, and the remainder of the 2018 WSOP schedule. 13 John Cynn Wins the 2018 WSOP Main Event for $8,800,000!